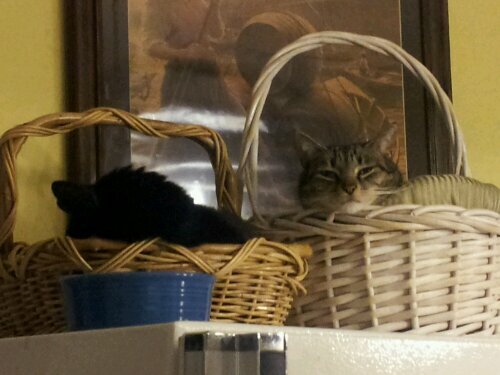 When we decided to put a second basket on top of the upright freezer as a cat bed, we had hoped that eventually the cats would be able to use them at the same time. And so they have. Yesterday, as I was finally finishing up the major kitchen cleaning and reorganization project I mentioned earlier, I put out the jar that holds cat treat and stocked it. That got someone’s attention. We know that sound… the sound of cat treat bags. Once I turned around and saw them staring at me, I quickly called to Kelly in the living room and asked her to get her camera. She did, and managed to nab a series of photos of the boys in their elevated beds. Scratch caught mid-yawn. Bucky is still pretty comatose. Once they saw I was only organizing and not actually feeding them, they decided to go back to napping. But Scratch watched me for a while longer. Yes, being a cat in the Hopkins-Michael household is a daily struggle. A struggle to stay awake. So kitchen pictures to come soon. I wanted to wait until I was totally done, including the little bit of painting. 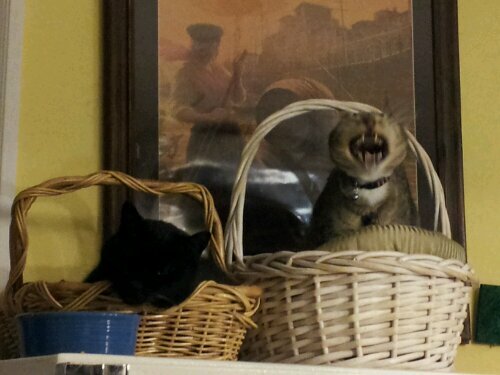 Awww….it looks like the duel baskets worked out fine.. SO glad! 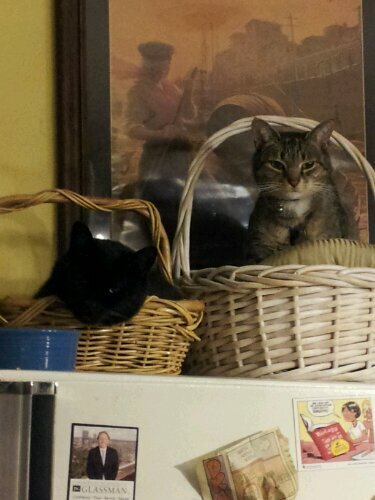 They used to fight over who would get to sleep in the basket. This is much better.